Yo Ho Ho a pirating we'll go! We had a wonderful pirate adventure in Cardiff Bay. We went on the land train, played in the Pirate park, dug for gold treasure, and went on a boat across the Bay. What a fun day! This half term we will be learning all about Holidays. We will find out how we travel on holiday and places we may go. 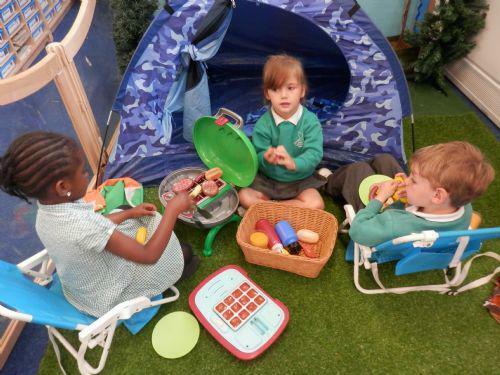 We have our very own campsite and holiday shop in our Nursery. We have built sandcastles in our garden. We loved putting up tents in our garden. We worked together and helped each other. We are looking forward to visiting Cardiff Bay. We will be travelling there by coach, going on a land train and a trip on a boat. It's going to be an exciting day! Welcome to our new children and families starting in the Nursery this week. 'Round and Round the Garden'. We will be reading the stories Jack and the Beanstalk, The Enormous Turnip, The Very Hungry Caterpillar and The Bad Tempered Ladybird. We will be planting beans, seeds and flowers in our garden. We will be hunting for minibeasts and collecting worms! We have our very own Garden Centre and Cafe in the Nursery for the children to enjoy. We went on a Mini-beast hunt. Look at what we found! Until we found what we were looking for. 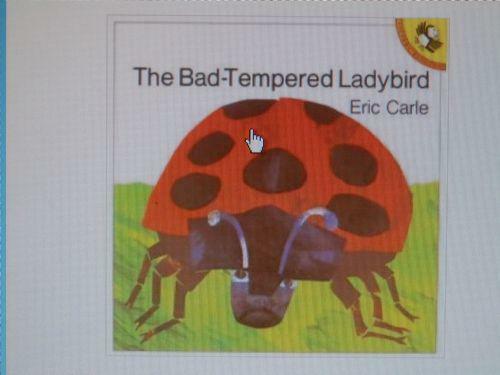 Ladybird, ladybird where are you? First we made our own ladybirds using play dough. We closed our eyes when they were being hidden. Afterwards we wrapped our ladybirds up to keep them warm for when they hibernate. Then put them in the garden in a safe place. 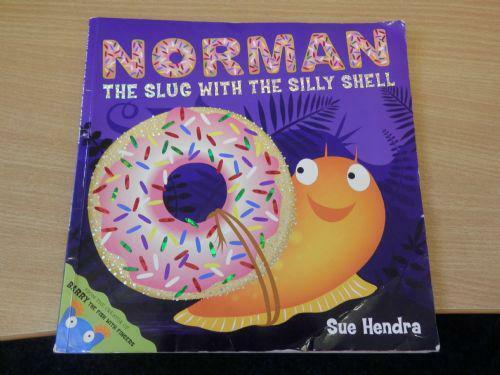 Did you know, Norman is really a slug. We all enjoyed our visit from Zoo Lab. The children were able to see and hold a number of different animals. It was a wonderful experience for the children. This half term we are using the book 'Dear Zoo'to learn about different animals. We have a 'Zoo Vet' in the Nursery so we can pretend to make the animals better if they are not well. We are looking forward to Zoo Lab coming to visit us on March 23rd. They will be bringing lots of animals for us to see and hold. We won't be allowed to touch the tarantula or the scorpion! We have made some slippery snakes using play dough. We enjoyed making Welsh Rarebit and Welsh cakes for St Davids Day. A very warm welcome to our new children and families starting Nursery in the next couple of weeks. Our Fish and Chip Shop is open and ready for business! We cut up potatoes and made our own chips. We have enjoyed listening to stories about different sea creatures.These are some of the books we like best. We have had a great day today celebrating Chinese New Year. Today we made our own Chinese food. We chopped up the vegetables. We even tried a few different vegetables. YUM! After cooking our stir fry, we had it for snack. Next we made our own Chinese Dragon music. WHAT A LOT OF NOISE WE MADE! Some of us made our own Dragon Dance.